The Alastair Lucas Prize for Medical Research will be awarded as a Fellowship with funding for up to two years. Applications are open. The Alastair Lucas Prize for Medical Research is open to researchers who wish to establish, or are establishing their career at Burnet Institute, Melbourne, Australia. 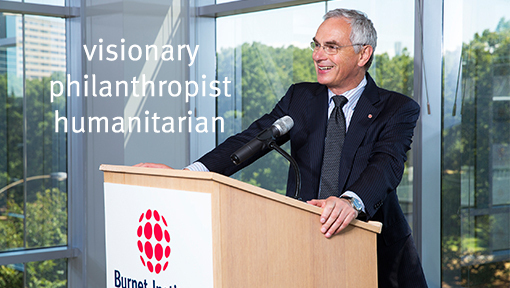 The competitive prize will be awarded as a Fellowship with funding (AUD$100,000 per annum) for two years, to pursue diseases and health issues of major national or global importance that align with the mission and focus of Burnet Institute. Details of Burnet’s thematic health programs are available on our website. The Alastair Lucas Prize was established by Burnet Institute in tribute to the late Alastair Lucas AO, former long-time Chair of Burnet Institute who died after a short illness in July 2015, at the age of 63. Alastair Lucas made an enormous contribution to the Institute as a Board member from the time he joined the Burnet Board in 1998, and as Chair from 2002 to the time he had to step aside due to ill health in September 2014. In honour of Alastair’s significant contributions, the board of the Institute established the Alastair Lucas Endowment Fund, which will provide funding for The Alastair Lucas Prize for Medical Research.